For a homebrew keg you will want to choose what is called a Cornelius keg. These keg have been used extensively by the soft drink industry and are easily found and converted to home brew draft beer service. The Cornelius Keg consists of a stainless steel body/vessel with plastic or rubber protectors covering the bottom and encircling the top. The top protector is fabricated with handles to make carrying the keg easy. The top of the body/vessel has a removable lid and two valves: an “IN” valve for gas and an “OUT” valve for liquid. The two valves are made up of a body (often called the body connect) and an internal, spring activated “poppet” which opens or closes the valve when engaged or disengaged. The gas body connect often has a base with teeth or a small notch to differentiate it from the liquid body connect. 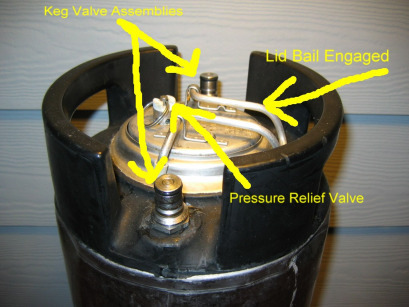 In use, you do not want to mix up the gas and liquid sides of the keg. The liquid valve is screwed down on an extruded threaded post on the body/vessel with an opening through which a stainless steel dip tube is mounted. The dip tube reaches down to a small sump in the bottom of the vessel. The gas valve is also screwed down on an embossed threaded post but the dip tube is very short to barely clear the inner side of the vessel. Each dip tube is seated on a small “O” ring or gasket to prevent leakage. 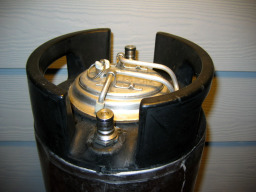 The removable top is what makes the Cornelius keg the best choice for homebrew kegging because it allows for easy filling of the keg. The top is oval shaped to match the fill opening on the vessel with a rubber gasket to seal the top against the vessel. The top of the vessel is embossed to allow the gasket and lid to fit. The removable top is seated on the underside of the embossed portion of the vessel’s top thereby allowing the pressure inside the keg to seal the top in place. The removable top also has a bail/locking device to hold the top in place with a lever-like action. There is also a pressure relief valve on the removable top that allows the internal pressure to be purged so that the top can be removed. The pressure relief valve is usually removable. If the top does not have a relief valve, replace the top. Dispensing your beer, using the Cornelius system is very straightforward, but you will need the proper fittings to do it correctly. It is a simple as this: once the keg is closed, it can be pressurized from the gas side and that pressure will force the beer out of the liquid side. With the gas pushing from above (through the short dip tube), your beer will flow from the bottom of the keg (through the long dip tube) once the proper valve opening is in place.